Imagine what could happen if your brain was working at its highest, most efficient level. If you were a musician, you could compose your best work and play it with confidence. If you were an executive, you could make financial decisions with clarity. While this may seem like wishful thinking, it is possible to improve your brain’s performance, allowing you to achieve more than you could otherwise. At FHE Health, we use neuro-rehab technology as one of our treatment options. It allows men and women to enhance the way their brain thinks and functions to minimize complications and enhance performance. Achieving peak performance is often something only thought about in sports. A person who is training for an event works hard physically to improve his or her skills. Yet, there’s also a component of brain training. That is, it’s also important to train the brain to see beyond that necessary skill. By envisioning that task at hand, it’s more likely a person can reach that higher level. Peak performance like this can be achieved by anyone. It can be done by performers or executives. It can also enhance your brain’s ability to perform and improve as you recover from anxiety and mental health illnesses. Imagine, then, what could happen if you could train your brain to achieve wellness, recovery and strength during rehab and recovery. What Is Neuro-Rehab, and How Can It Help You? Neurotherapy, or neuro-rehab technology, works to train your brain through improved neuroplasticity. It helps you focus and allows you to teach your brain how to accomplish goals at a much higher level than you may have been able to do previously. The use of neurostimulation increases neuroplasticity. You may have heard of this as a type of game or a method of improving your brain’s function. The science behind it is a bit more complex. The term describes the brain’s ability to reorganize and form new connections throughout your lifetime. Researchers have found that the brain changes by forming these pathways of communication as it goes through life. When a person has a disease or an injury or is involved in a new type of activity, the brain works to create new neurons to help adjust to the new situation. For example, in some people, when one side of the brain suffers an injury, the other side of the brain can begin to take over some of those functions. This happens because the brain reorganizes to compensate for the damage. This type of new neuron formation doesn’t just happen instantly. Rather, the neurons need some type of stimulation to get them to start being active and sprouting. One form of stimulation used is called transcranial direct current stimulation or tDCS. In this form of stimulation, numerous electrodes are attached to the patient’s head. Then, a low direct current is passed through these electrodes to the brain. It is very safe to use and creates a significant improvement in many people, stimulating specific areas of the brain to create an activity that causes neurons to sprout. The use of neurostimulation like this, including tDCS, isn’t uncommon. For example, the US Army is using it as a way to reduce training time in snipers, and it has been used in Olympic skiers and snowboarders to help increase focus — all with the goal of trying to achieve peak performance. Still Unsure About Peak Performance? The movie “Limitless” is a good presentation of what achieving peak performance is, though its focus is a bit different. In the science fiction thriller, a struggling writer is introduced to a drug called NZT-48. The drug gives those who use it the ability to fully use their brain. As a result of this, it significantly improves the character’s lifestyle. He is suddenly able to achieve amazing things, all because his brain is working at its highest level possible. While the nootropic drug in this film isn’t real, the actual ability to create neurons in the brain that develop a better ability to focus, heal and recover very much is. That’s the goal of neuro-rehab technology. How Can Brain Training Help with Addiction and Mental Health? Neuro-therapy like this can be highly effective in aiding in addiction recovery and mental health improvement. In a study published by the U.S. National Library of Medicine, neurofeedback was used to treat patients who were dependent on opiates. The study found that individuals who received the treatment had less withdrawal impact, better physical health and an anticipated positive outcome. In most situations, it works as a component to addiction treatment and as a cognitive stimulation and rehabilitation tool. It helps people in therapy to see improvements in their health by helping them to apply drug treatment more effectively. By stimulating the brain’s plasticity, it is possible to help those with an addiction to learn techniques and strategies for avoiding drugs, coping with situations and working through negative thought patterns. All of these factors and many others can help an individual in addiction treatment to excel. 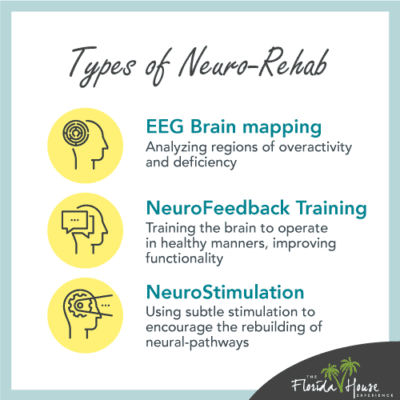 While no one is claiming neuro-rehab technology is the only component of treatment, it is often one of the best ways to see enhanced success as you enter rehab. What’s more, there are no symptoms or negative outcomes from the use of this technology, only benefits. As a leading provider of drug and alcohol addiction treatment, FHE Health continuously offers the most advanced care options for patients. That includes providing you with access to your peak performance. Meet with our admissions counselors today to learn more about how we can help you recover.